How To Create Paragliding Wristbands? 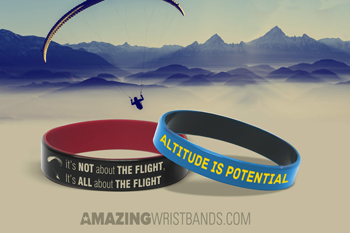 Personalized Paragliding wristbands are inspired by the interactive sport known as paragliding. Over the past ten years, Paragliding has developed into one of the most thrilling activities. Thousands of people have discovered a new sense of freedom they feel when enjoying this sport. Paragliding is a sport in which the pilot has complete control over the flying device, allowing him or her to fly for hours if desired! A paraglider looks similar to a parachute since the paraglider evolved from the parachute. When the pilot is paragliding, he/she sits under a canopy attached to a harness by a web of supporting strings. In the actual canopy are tubes inflated by rushing wind. Paragliders can fly all over and perform a variety of stunts, and flights can last for as long as the pilot is willing.